If so, I'd have a couple of questions about Namcot-163. 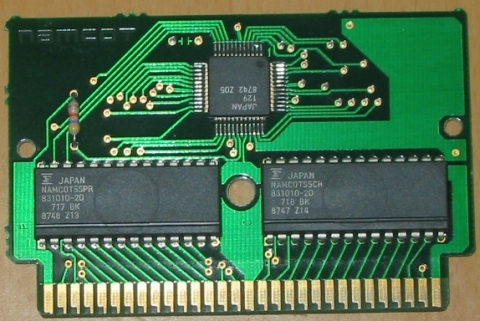 1. is there any game which actually uses CIRAM as PPU RAM? 2. docs are not 100% clear about $f800 reg. it seems to work both as External RAM protect *and* for sound address... but when is it used for one and when for the other? does the effect depend on bit4 or on something else? or is it always used for both? Last edited by etabeta on Wed Apr 17, 2013 7:20 am, edited 1 time in total. I helped BootGod modify his CopyNES so that he could verify everything I'd transcribed from naruko's notes; he said he agrees with the behavior I've transcribed on the wiki. With one bonus: Masamune is weird. The four epoxy blob version of Masamune is bizarre in a completely inscrutable way that we couldn't figure out. If the smallest epoxy blob is destroyed or disabled, the cartridge seems to act like a perfectly normal N163 cartridge. If the smallest epoxy blob is functional, writes to internal RAM must first be written to $6000, and then the write to $4800 uses the value that had been written to $6000. Reads act as normal regardless. However: the game seems to work perfectly fine regardless of whether the behavior is proper N163 or this bizarro-land variant. I'd say that your summary is, with the specificity that "CHR-ROM to PPU RAM" means specifically "as pattern tables"
Naruko and BootGod both verified the behavior, but couldn't find a specific game that relied on it. Disch claims that specific games exist that rely on this behavior, but doesn't provide a name. It is always both. So there's some hilarious dances in (i think?) e.g. King of Kings to update music registers at the same time as it keeps PRG-RAM writeable. I don't know whether there's actually two separate registers inside, but it looks like that should be academic: if the register is shared, when the auto-increment bit is set, PRG-RAM is write-protected. The N163 natively generates samples at 119kHz always, and rotates between all the channels. A good resampler should be the only hard part about it. thanks a lot for the replies, it all makes sense now (for what an epoxy block can make sense ). Yes, there's no separate CHR-RAM. 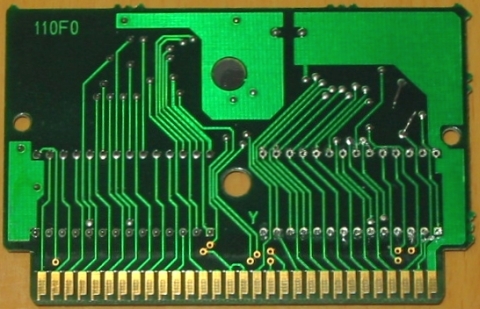 The VRAM can be mapped to both nametables and pattern tables at the same time—it just has the ability to map any of the bottom 256KiB of CHRROM or the 2KiB RAM on the mainboard into any of the twelve bottommost 1KiB slices of the PPU's address space. (Modulo the bit about ROM nametables can only only come from the bottom 224KiB of CHRROM) But I agree that it seems likely the games either use 1 screen mirroring and use the other KiB like TQROM, or maybe use ROM nametables. For what it's worth, I think I found some ROM nametables in Battle Fleet (about half of the last 32KiB of the 128KiB CHRROM), and the last 6KiB of Megami Tensei 2's 256KiB CHR looks like non-tile data—so maybe this is a game to investigate for using RAM-as-pattern table? I see one good reason to use the TQROM configuration in a video game made only for Japan.